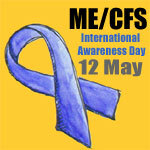 There are lots of simple things you can do to raise awareness of ME/CFS this May. – Share a YouTube or Vimeo video from a sufferer or activist, or make one of your own. Using your blog, Facebook, Twitter, MySpace or email you could share a video that highlights some aspect of ME/CFS, Fibromyalgia and/or related conditions. There are lots of videos out there on the internet and there’s a short selection below. Or why not make your own? If you are blogging for ME/CFS Awareness this May we would like to add you to our list of Participants for 2009. You can see an up to date list of bloggers and their posts there. We welcome bloggers for ME, CFS, CFIDS, FMS, FM, MCS, PVFS, Gulf War Syndrome and related conditions. Also on this blog you will find Badges you can use on your blog, web site or for your profile picture on sites like Facebook, MySpace and Twitter. Along with a list of ideas and links for What You Can Do to raise awareness of ME/CFS. Read About ME/CFS and what’s behind this blog or read/search through the blog posts here to find activities and events happening in your local region and internationally. The Reading Area ME Support Group are seeking volunteers to help at aDebenhams promotion day in Slough during M.E. Week. There will be an information stand along with fundraising for Action for ME. Debenhams will be displaying Action for M.E. collection tins on all their tills and be selling Action for M.E.. promotional products. Alongside this there will be local press advertisements and a radio competition on Time 106.6 and an Action for M.E. display inside the shopping centre. All this will enable us to raise more funds, and increase awareness of both us as a charity and also for the illness as a whole. We are asking if you could please help out at this event – either on the stall, or to collect at the door. Collections will occur 13th-16th May and a presence in the shopping centre will be also for these dates. We will need at least 6 people to be present at each time (2 people for each door, plus 2 people at the stand). (Timings TBC). Chairs will be available so that you can sit down. If any of you at all could please help with this event, it would be very much appreciated so that we can make this fundraising and awareness activity, a success. You will need to be present between 11am-3pm. Facebook users can indicate their attendance of M.E. Awareness week through a scheduled event on the site. Jennifer Phillips works on raising awareness, campaigning, fundraising and outreach programmes for Fibromyalgia all year round. During May’s Awareness Month she continues her work. She also shares her birthday with Awareness Day on May 12th. Her Get The FA-CTS blog details much of the work she is involved in. Jennifer Phillips is a spokesperson and mentor for Fibromyalgia Awareness, working towards increased education and funding. s an advocate with CFIDS, American Pain Foundation, American Fibromyalgia Syndrome Association, and many other organizations within the Fibromyalgia Community. Jennifer has addressed Congress, lobbied on Capital Hill, and helped raise over $2 Million for research. Jennifer is a mentor to others with Fibromyalgia, sharing her personal story of triumph; a story that has been documented in 6 National and 2 International Publications. As a survivor, Jennifer not only shares her knowledge of how to overcome the disease, she shares her birthday, May 12th with International Fibromyalgia Awareness Day! Her mission is to continue to empower others to overcome the often misunderstood disease, and to aid in establishing May as National Fibromyalgia Awareness Month. Jennifer is a Program Manager with a company that holds patient outreach and educational programs for chronic conditions which is why she is so passionate about working for them to help others. Persons with CFS, CFIDS, ME and FM in Massachusetts can find advocacy resources on their local Association’s web site. The Massachusetts CFIDS/ME & FM Association has advice about letter writing for 12th May and International Awareness Day for CFIDS/ME and FM. Individuals can describe their personal experiences with these illnesses, as well as emphasize the need for national recognition and increased research funding of CFIDS/ME and FM. Educating others, communicating the needs of this patient community and/or taking action on other issues goes well beyond what can be achieved in a single day. Responding to various opportunities or situations that may arise throughout the year is a constructive way to make use of one’s knowledge and experience of the illness. Their resources include a sample letter, contact details for congress and senate, as well as links to some key advocates.